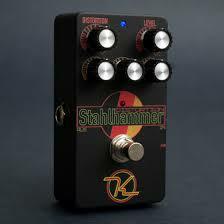 The Keeley STAHLHAMMER Distortion is a hard hitting distortion pedal with no equal at Keeley Electronics. For cranked British amp sounds,this unique pedal design delivers. Keeley has combined classic highgain amp distortion and added atube amp style EQ to give you awealth of tones. This unique structure has two modes of operation – High Gain/TubeSaturation switchable from the right side of the pedal.The three tone controls, Bass – Middle –Treble, give you a fantastic rangeof amp sounds that you will be both familiar with and find easy to dial in.